McDonalds had started its operations in Western India and post the opening of 12 to 15 stores all across they seemed to settle down. This was the time according to their brand mandate they were in the ‘the trusted neighbour’ stage. Time had come to expand and add services to their portfolio and reach out to their consumers. The thought was to initiate a Delivery Service to the neighbouring locality from the corresponding store. 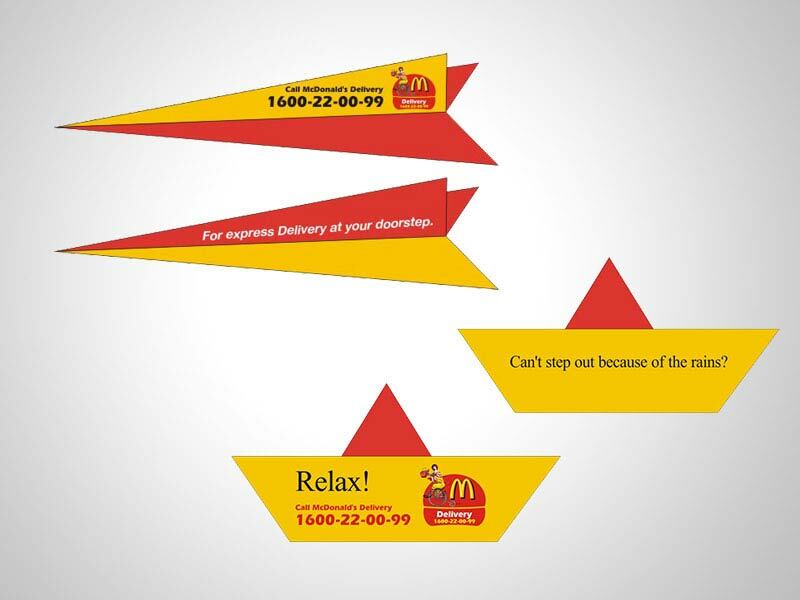 After having seen a few options of the launch creative, McDonalds approached Collateral to create a mnemonic that would represent the delivery service. Collateral, having done the Aliens Birthday Party campaign successfully for McDonalds, swung into action. The thought was to stick to the basics and use elements that were intrinsic to McDonalds. Collateral designed a logo that had Ronald McDonald, their Superstar, who is usually seen sitting outside their stores, put him on a penny and farthing bike with a Happy Meal in his hand, the golden arches and the burger shape all synonymous to McDonalds, finally the all important toll free number at the base, and we had cracked it! The new McDonalds Delivery Service Logo! The years of experience in the print advertising domain, Collateral was equipped to develop an entire print campaign that involved teasers and reveal outdoor, ads, collaterals and in-store elements. Even the call for delivery staff had the flavour of the delivery service. The marketing campaign was extended to reach out to corporates using simple effective Direct Mailer ideas and posters. The McDonalds Delivery Service had arrived at the consumers’ doorstep! 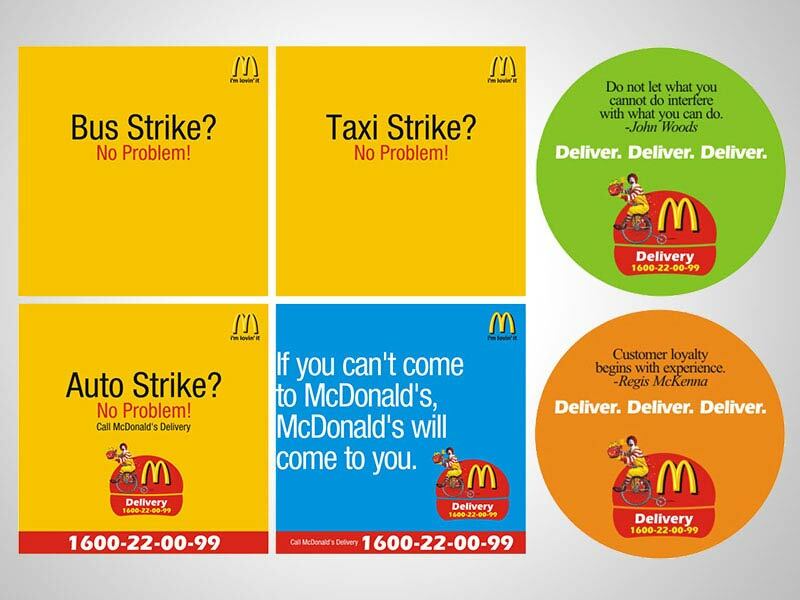 Buoyed the success of the Deliver Service campaign, this time McDonalds was eyeing for the bigger achievement, the hunt for getting the passionate advertising agency on board was put to an end, when they called Collateral to get associated for another initiative. 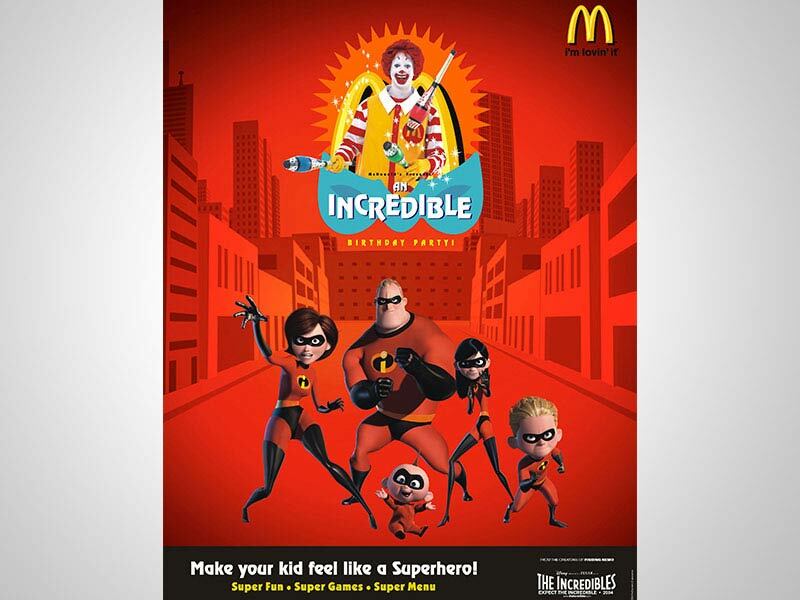 This was a tie-up with Disney production Pixar picture animation film ‘The Incredibles’. Post meeting the Disney and Pixar team and understanding the storyline, team Collateral went to work. The result was a combination that promoted the film as well as the birthday party areas in the McDonalds stores in Mumbai and across all cities in India. Simple elements that the children could relate to were used to generate interest. The invitation deck consisted of masks that each character wore in the film, these were given to the children who were invited and they happily wore those to represent the characters. The invite itself was a ‘boomerang’ that was used by a character in the Oscar winning animation film. The birthday party areas were decked up to give a feel of the film set and the decals depicted action shots of Mr. Incredible and his super family. 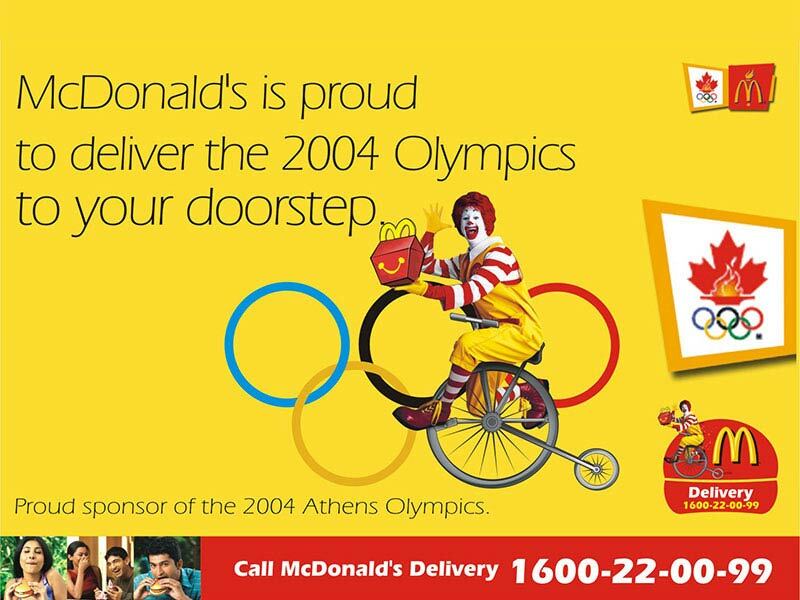 Not to forget the McDonalds visibility the main unit or the motif of the campaign had all the elements of fun that McDonalds represents such as the golden arches in the background with Ronald McDonald at play.